Salmon makes a quick and easy weekday meal, but how do you make it interesting? This lemon butter salmon with potatoes and asparagus is certainly that. What a delicious, healthy meal perfect any time of year – and you’ll only have one pan to wash! One of our go-to easy weekday meals is simple baked salmon and roasted vegetables, but I decided to switch things up a bit and make a slightly fancier springtime variation. So how exactly is this baked salmon fancier? Well, lemon butter sauce for one thing. Asparagus for another. Lovely lightly crispy potatoes for yet another. 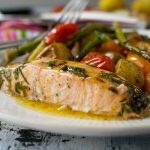 Lemon butter sauce is a perfect sauce for salmon, and it’s so simple you’ve possibly got all the ingredients for it already. 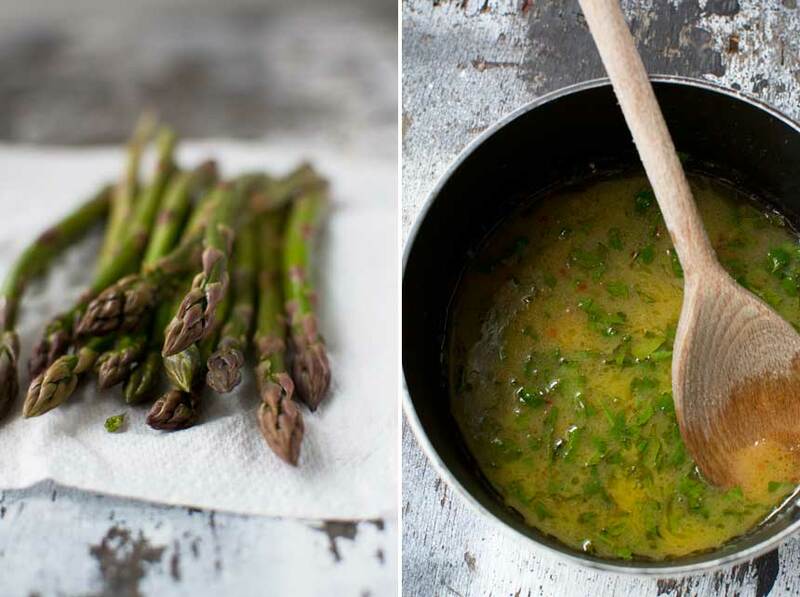 The asparagus you’ll most likely need to make a trip to the shops for, but how can you not make the most of this seasonal little beauty? Asparagus has got to be one of my favourite foods. 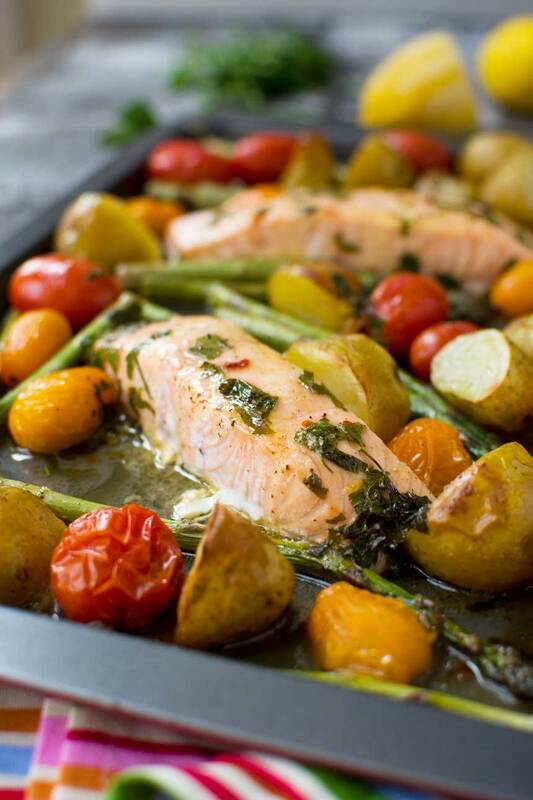 It’s so delicious pan fried or baked, and hardly takes any time to cook, which makes it a perfect addition to this salmon with potatoes and asparagus sheet pan dinner! Combine butter, lemon juice, garlic and parsley for the perfect light dressing for your salmon and veggies! 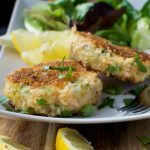 The beauty of this meal is that all of the ingredients take an equal amount of time to cook – just ten minutes! 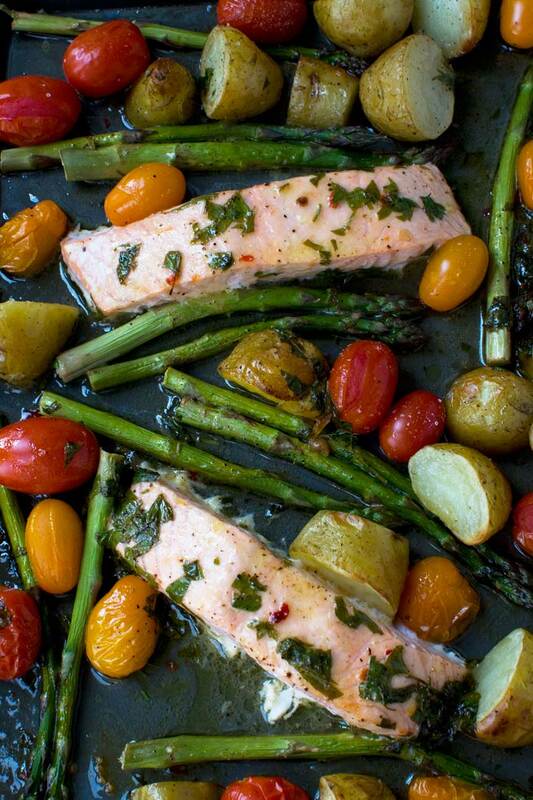 Think about it – salmon (roughly ten minutes), asparagus (bake for ten minutes), mini tomatoes (beautiful roasted after just ten minutes). The only part of this that takes a little longer is the roasted potatoes. And we take care of this by popping them into the oven with a little olive oil for about 25 minutes before adding everything else to the sheet pan (that’s a baking tray if you’re in the UK or Australia!). 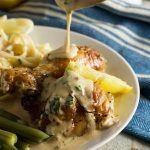 You might be quaking at the knees already at the sound of that delicious lemon butter sauce. But it’s even more delicious after the sweet and juicy tomatoes have mingled with it. Have you ever tried butter with tomatoes? Trust me, it’s delicious (and I’m not even a fan of butter!). I find the best way to eat this salmon sheet pan dinner is with some lovely fresh crusty bread to mop up the scrumptious juices. But you can’t make this meal ahead… can you? Yes, you can! Just in case you have a demanding young child like I do and need to prepare dinner whenever you can, I discovered that you can make this ahead. Simply reheat it by covering with aluminium foil and popping in the oven at 325F/140C for 20 minutes. I wasn’t sure how cooked fish would turn out reheated, but it wasn’t at all dry or overcooked. 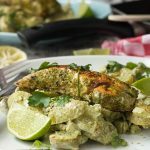 If you're looking for quick, easy and interesting way to bake salmon, this lemon butter salmon with potatoes and asparagus is it! And there'll be only the one pan to wash! You can (surprisingly) make this ahead. Simply reheat it by covering with aluminium foil and popping in the oven at 325F/140C for 20 minutes. Helen this looks absolutely SCRUMMY!!! Scrumptious. 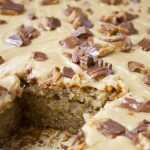 Melt in your mouth delicious and all on one pan. Love that. Pinning and saving for later. Wishing you a super week! This looks amazing, Helen! And your timing is perfect because asparagus is at its peak!! Thanks, Marissa. I eat so much asparagus at this time of year. I love it! You make the easiest and most delicious sinners Helen. This salmon looks amazing! Can’t wait to try it. Thank you, Mira. What a compliment! I love every bit of it, it’s taste amazing. Great to hear, Jenna. Thanks for taking the time to leave your review! So glad you approve, Anna! 😉 Thanks so much for taking the time to comment (especially when you don’t usually!!!). I really hope you enjoy the recipe – we love it!